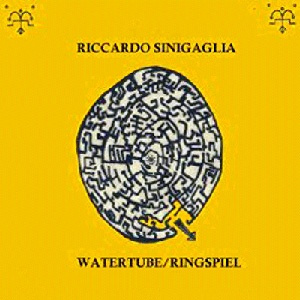 Originally released in 1985 as a cassette on the ADN Tapes label, this was Sinigaglia’s first solo release after having been a member of the experimental world music trio Futuro Antico. The two long tracks on this represent the experimental ideal that ADN was known for, many artists from around the world working on limited budgets producing music that was way outside the mainstream of any musical genres. Both of these pieces clock in at exactly 15:30, but are as different as day and night. “Watertube” presents an ambient exploration of sound, using synthesizers, prepared piano, taped and sampled sounds, and other mysterious instrumentation – including the presumed watertube, which appears about six minutes into the piece. It freely wanders through numerous paths, often the sounds seem as if they are looping over one another asynchronously, the piano and other percussives dueling with the pulsating sound of the tube and other mysteriously shimmering sounds that haunt the background. The chaos reaches its pinnacle around the ten minute mark and then gently subsides, recalling the keyboard sounds that started the journey. “Ringspiel” opens with the sounds of a toy musical box, gently giving way to keyboard sounds punctuated by percussives through a speed changing tape loop, followed by a somewhat haunting random melody driven by what sounds like an effected zither, with plenty of studio effects and soundloops rounding out the textural soundwall. Since no instrument credits are provided, one can only guess while analyzing how the sounds were made, or just skip the analysis and just kick back and enjoy wherever it takes you.